Dubai: Shaikh Rashid Bin Mohammad Bin Rashid Al Maktoum died of heart attack on Saturday. He was 34. Funeral prayers will be held after Maghrib prayers at Zabeel Mosque. The burial will be held in Bur Dubai's Umm Hurair cemetery. A three-day mourning period has been declared in Dubai and the rest of the UAE. UAE flags will be flown at half mast during the mourning period. Dubai government departments, however, will continue to function during this period. Shaikh Rashid was the eldest son of His Highness Shaikh Mohammad Bin Rashid Al Maktoum, Vice President and Prime Minister of the UAE and Ruler of Dubai. Shaikh Rashid was a keen horse lover and was the owner of Zabeel Stables. Shaikh Hamdan Bin Mohammad Bin Rashid Al Maktoum, Crown Prince of Dubai, and Shaikh Rashid's brother, expressed his sadness on Twitter and Instagram. "Today, I lost a best friend and a childhood companion. 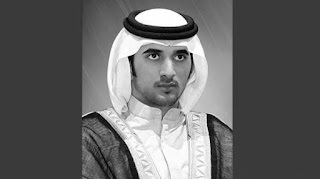 My dear brother Rashid you will be missed," Shaikh Hamdan said in a message posted on the social media sites. President His Highness Shaikh Khalifa Bin Zayed Al Nahyan mourned the death of Shaikh Rashid. Shaikh Khalifa expressed his heartfelt condolences and solace to Shaikh Mohammad. His Highness Shaikh Mohammad Bin Zayed Al Nahyan, Crown Prince of Abu Dhabi and Deputy Supreme Commander of the UAE Armed Forces, expressed his sincere condolences to Shaikh Mohammad and the Al Maktoum family. His Highness Shaikh Sultan Bin Mohammed Al Qasimi, Supreme Council Member and Ruler of Sharjah offered his heartfelt condolences and solace to Shaikh Mohammad. His Highness Shaikh Humaid Bin Rashid Al Nuaimi, Supreme Council Member and Ruler of Ajman, also offered his condolences. His Highness Shaikh Saud Bin Rashid Al Mu'alla, Supreme Council Member and Ruler of Umm Al Quwain, mourned the death of Shaikh Rashid. Shaikh Saud offered his condolences to Shaikh Mohammad, Shaikh Maktoum Bin Mohammad Bin Rashid Al Maktoum, Deputy Ruler of Dubai, and the Al Maktoum family.